WITH the approval of the community blueprint for West Byfleet’s future has come an immediate challenge to aspirations for safeguarding open spaces in the village. Villagers are alarmed that a planning application is to be made soon for a pub restaurant to be built on part of their recreation ground. This contravenes the Green Belt policies of the West Byfleet Neighbourhood Plan, which was approved by a huge majority in a local referendum last Thursday. The pub plan is being prepared by Marston’s Estates Ltd, part of the Marston’s brewery conglomerate, which distributed a leaflet detailing its intention and asking for residents’ views at the West Byfleet LIVE event in July. Marston’s Estates also intends to build a sports and community building to replace the recreation ground pavilion. This would be financed by a “community contribution” as a condition of obtaining planning permission. But Wade Pollard, chairman of West Byfleet Neighbourhood Forum, says building on the recreation ground should not be allowed, as it is open space which the neighbourhood plan says should be preserved. Mr Pollard, who had a significant role in the preparation of the neighbourhood plan, said Woking Borough Council was selling the land to the brewery but it was not clear whether it had the right to do this. “It was originally owned by Byfleet United Charity and then controlled by Byfleet Parish Council, but taken over by Woking after the parish council was abolished,” he said. He added that the recreation ground would be needed even more after the 255 flats on the Sheer House site and the 117 homes at Broadoaks are occupied. 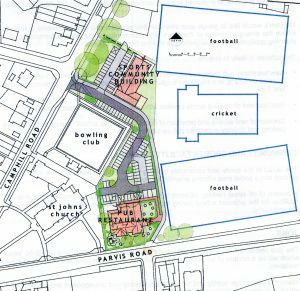 The 900-place secondary school to be built at Broadoaks will have no playing fields, so its pupils would probably use recreation ground for sports. A Woking Council spokesman said this week: “The council, as land owner, has agreed terms with Marston’s for its proposal subject to it obtaining planning consent. “Marston’s will be submitting its application shortly and the planning merits of the proposal will be considered in due course by planning officers and the planning committee. West Byfleet currently has two pubs, one either side of the railway line – The Yeoman Harvester in old Woking Road and The Station in Station Approach. Wolverhampton-based Marston’s says its new pub restaurant will create between 55 and 60 jobs. An overwhelming majority, 91.7%, of the residents who took part in last week’s referendum voted for the West Byfleet Neighbourhood Plan to be adopted. It will now be presented to the borough council on Thursday 7 December for formal adoption, after which it must be taken into account when determining planning applications in the area.